^ Marenbon, John (2010). Robert E. Bjork, ed. The Oxford Dictionary of the Middle Ages. Oxford, England: Oxford University Press. p. 2. ISBN 978-0-19-866262-4. ^ Oliver, Michael (1995). "Review: a CD of Abelard's music". Gramophone. Archived from the original on December 9, 2007. Retrieved 7 December 2008. (Registration required (help)). Marenbon, John (2004). "Life, milieu and intellectual contexts". In Brower, Jeffrey E; Guilfoy, Kevin. 'The Cambridge Companion to Abelard. Cambridge University Press. pp. 14–17. "Introduction". 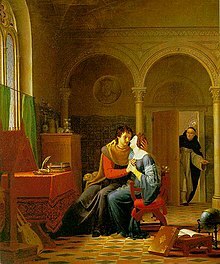 The Letters of Abelard and Héloïse. Translated by Radice, Betty. Introduction by Betty C. Penguin. 1947. pp. 47–50. King, Peter. 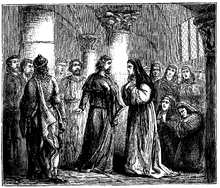 "Peter Abelard". In Zalta, Edward N. Stanford Encyclopedia of Philosophy. This page was last edited on 31 January 2019, at 15:45 (UTC).